The Warpaint philosophy is simple--everyone wants gorgeous, sparkling white teeth, but it's important to respect both your own personal health and the environment. So, this innovative new teeth whitening solution has been built off of a holistic approach to achieving beautiful pearly whites, using only organic ingredients and not a single harsh chemical or additive. 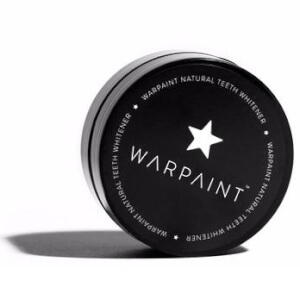 With just one product in their range, Warpaint have been able to focus all of their energy and resources on perfecting their blend of charcoal-based teeth whitening powder. With activated coconut shell charcoal, and other antioxidant ingredients such as bentonite clay, sweet orange peel, lemon myrtle and peppermint, this is the most beautiful way to whiten your teeth. Plus, it's not just beneficial on the cosmetic front--Warpaint also has quite the impressive resume, full of dental benefits. Warpaint customers have noticed that this unique formula helps to strengthen tooth enamel, detoxify the mouth, improve breath and protect the gums, for better oral health on the whole! Don't be deterred by it's colour, either. Although you'll experience a little mess and quite the scary smile whilst using Warpaint, it doesn't leave behind any residue or cause colours to transfer. Simply rinse out and your teeth will look better than ever! With 150 uses in each tub, Warpaint is also super long-lasting! Use every day for superior whitening abilities, or a few times a week to keep already-white teeth in check!